arjunaḥ uvāca—Arjuna said; param—supreme; brahma—truth; param—supreme; dhāma—sustenance; pavitram—purest; paramam—supreme; bhavān—Yourself; puruṣam—personality; śāśvatam—original; divyam—transcendental; ādi-devam—original Lord; ajam—unborn; vibhum—greatest; āhuḥ—say; tvām—unto You; ṛṣayaḥ—sages; sarve—all; devarṣiḥ—the sage among the demigods; nāradaḥ—Nārada; tathā—also; asitaḥ—Asita; devalaḥ—Devala; vyāsaḥ—Vyāsa; svayam—personally; ca—also; eva—certainly; bravīṣi—explaining; me—unto me. 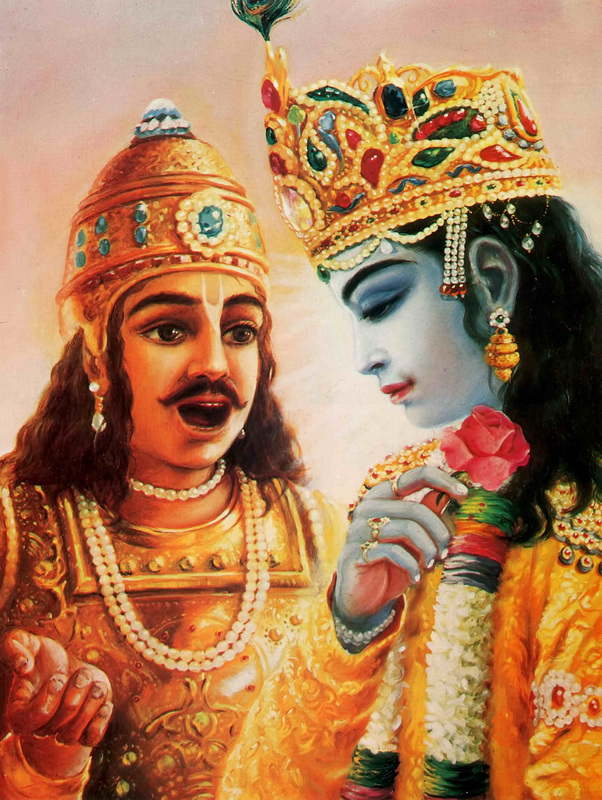 Arjuna addressed Krsna: "You are the Supreme Brahman, the ultimate, the supreme abode and purifier." Arjuna said: You are the Supreme Brahman, the ultimate, the supreme abode and purifier, the Absolute Truth and the eternal divine person. You are the primal God, transcendental and original, and You are the unborn and all-pervading beauty. All the great sages such as Nārada, Asita, Devala, and Vyāsa proclaim this of You, and now You Yourself are declaring it to me. In these two verses the Supreme Lord gives a chance to the modern philosopher, for here it is clear that the Supreme is different from the individual soul. Arjuna, after hearing the essential four verses of Bhagavad-gītā in this chapter, became completely free from all doubts and accepted Kṛṣṇa as the Supreme Personality of Godhead. He at once boldly declares, "You are Parambrahma, the Supreme Personality of Godhead." And previously Kṛṣṇa states that He is the originator of everything and everyone. Every demigod and every human being is dependant on Him. Men and demigods, out of ignorance, think that they are absolute and independant of the Supreme Lord Kṛṣṇa. That ignorance is removed perfectly by the discharge of devotional service. This is already explained in the previous verse by the Lord. Now by His grace, Arjuna is accepting Him as the Supreme Truth, in concordance with the Vedic injunction. It is not because Kṛṣṇa is an intimate friend of Arjuna that he is flattering Him by calling Him the Supreme Personality of Godhead, the Absolute Truth. Whatever Arjuna says in these two verses is confirmed by Vedic truth. Vedic injunctions affirm that only one who takes to devotional service to the Supreme Lord can understand Him, whereas others cannot. Each and every word of this verse spoken by Arjuna is confirmed by Vedic injunction. In the Kena Upaniṣad it is stated that the Supreme Brahman is the rest for everything, and Kṛṣṇa has already explained that everything is resting on Him. The Muṇḍaka Upaniṣad confirms that the Supreme Lord, in whom everything is resting, can be realized only by those who engage constantly in thinking of Him. This constant thinking of Kṛṣṇa is smaraṇam, one of the methods of devotional service. It is only by devotional service to Kṛṣṇa that one can understand his position and get rid of this material body. In the Vedas the Supreme Lord is accepted as the purest of the pure. One who understands that Kṛṣṇa is the purest of the pure can become purified from all sinful activities. One cannot be disinfected from sinful activities unless he surrenders unto the Supreme Lord. Arjuna's acceptance of Kṛṣṇa as the supreme pure complies with the injunctions of Vedic literature. This is also confirmed by great personalities, of whom Nārada is the chief. Kṛṣṇa is the Supreme Personality of Godhead, and one should always meditate upon Him and enjoy one's transcendental relationship with Him. He is the supreme existence. He is free from bodily needs, birth and death. Not only does Arjuna confirm this, but all the Vedic literatures. the Purāṇas and histories. In all Vedic literatures Kṛṣṇa is thus described, and the Supreme Lord Himself also says in the Fourth Chapter, "Although I am unborn, I appear on this earth to establish religious principles." He is the supreme origin; He has no cause, for He is the cause of all causes, and everything is emanating from Him. This perfect knowledge can be had by the grace of the Supreme Lord. Here Arjuna expresses himself through the grace of Kṛṣṇa. If we want to understand Bhagavad-gītā, we should accept the statements in these two verses. This is called the paramparā system, acceptance of the disciplic succession. Unless one is in the disciplic succession, he cannot understand Bhagavad-gītā. It is not possible by so-called academic education. Unfortunately those proud of their academic education, despite so much evidence in Vedic literatures, stick to their obstinate conviction that Kṛṣṇa is an ordinary person.